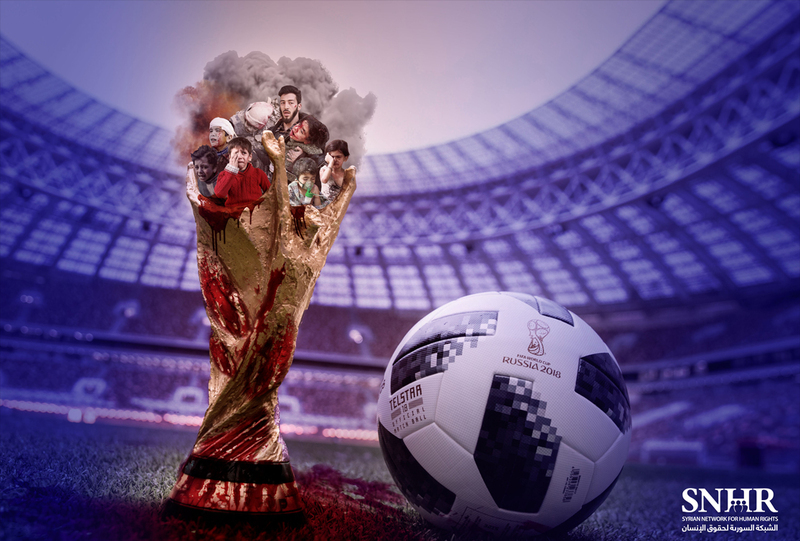 SNHR has released a report entitled: “The World Cup is Tainted with the Blood of 6,133 Syrian Civilians Killed by Russia” documenting the most notable violations by Russian forces since the start of its military intervention in Syria on September 30, 2015. The report notes that Russian warplanes were demolishing and exterminating tens of thousands of Syrians thousands of kilometers away from the Russian capital Moscow at a time when Russia was constructing stadiums, hotels, and hospitals as part of its campaign to organize the World Cup. The Russian regime, hence, is a primary partner in the Syrian regime’s serious violations, firstly, and, secondly, a direct perpetrator of serious violations. The report stresses that the World Cup is an opportune moment to remind the world of the atrocities that Russia have perpetrated in Syria and expose its support for the most barbarian regime of the modern age, as the pictures of children, women, and civilians who were killed by Russian forces and the hospitals, schools, facilities, and buildings that have been destroyed by the savage, indiscriminate bombardment on tens of Syrian cities and towns have laid bare the barbarian and inhumane facet of the existing Russian regime which, most certainly, doesn’t deserve the opportunity to organize the World Cup, according to the report, as its natural place should be on trial. The report notes that SNHR possesses a comprehensive, detailed database for all the incidents and victims killed by Russian forces that include various details. Targeting many hospitals with directed missiles, the report notes, remains one of the most atrocious acts that Russian forces have carried out, as well as their extensive use of cluster munitions, exterminating whole towns off the face of the map in the region of Eastern Ghouta through hundreds of airstrikes carried out by swarms of warplanes. 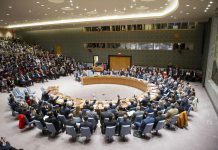 The report pinpoints three main points that summarize Russia’s role at the Security Council with respect to Syria, where Russian was involved, as a permanent state member of the Security Council, in stabilizing security and peace in Syria through a brutal bombardment that have never been precedented in terms of its intensity and indiscrimination instead of working with the other members of the Security Council on protecting the Syrian people from the daily killings that the Syrian regime has been perpetrating since the very first days of the popular uprising. According to the report, not only did Russia perpetrate tens of thousands of violations, many of which constitute war crimes, it also shamelessly resorted to lying and misguiding by denying those violations, whether through questioning their occurrence or accusing other parties of being responsible for them. On the other hand, Russia used its veto powers 12 times against any resolution that would condemn, confront, or demand the Syrian regime to be held accountable. This gave the Syrian regime an absolute immunity and encouraged it to elevate the various types of its violations, including killing, torture, and shelling. The report stresses that the Russian intervention under the pretense of striking ISIS and al Nussra Front was used as a justification for the killing and indiscriminate destruction, while the unprecedented brutalities perpetrated by the Syrian regime and its Iranian and Russian allies against the Syrian people remain the main and primary cause for ISIS’s emergence and establishment according to the report. The report notes that 6,133 civilians, including 1,761 children and 661 women (adult female), were killed by Russian forces who also perpetrated 317 massacres. According to the report, no less than 939 attacks on vital civilian facilities have been documented, including 167 attacks on medical facilities, 140 attacks on mosques, and 55 attacks on markets. The report notes that Russian forces have carried out no less than 223 attacks using cluster munitions, in addition to 122 attacks using incendiary ammunitions. Additionally, the report notes that Russian forces provided a support for the Syrian regime in three chemical attacks whether before or after the attack. One of the most major ramifications, the report adds, of the Russian offensives along with its two allies, the Syrian and Iranian regime, were forcibly displacing no less than 2.5 million individuals. The report stresses that the Russian regime has violated, beyond any doubt, Security Council resolutions 2139 and 2254 which both states that indiscriminate attacks must be ceased. Also, the Russian regime has violated, through the crime of willful killing, Article 8 of Rome Statue, which constitutes war crimes. According to the report, Russian forces have violated the rules of the customary international humanitarian law and the international human rights law which guarantee the right to life. In addition, these indiscriminate attacks were carried out in a non-international armed conflict, which constitutes a war crimes as all elements have been fulfilled. The report calls on the Russian regime to Immediately compensate the families of the victims who were killed by Russian forces, and those whose homes, shops, and properties were destroyed in Russian bombardments. Moreover, the report calls on the Russian regime to pledge to reconstruct all of the facilities and buildings that were destroyed by its instruments of war, and shoulder the complete economic and moral expenses instead of asking some European states to do so. The report adds that Russia should respect the rules of the international humanitarian law and launch wide, impartial investigations into the gross violations Russian forces perpetrated in Syria. The report also calls on Russia to stop using veto to protect the Syrian regime who has been involved in perpetrating crimes against humanity and war crimes, as well as using chemical weapons. Further, the report stresses that the Russian regime should Launch investigations into the support provided by Russian forces in Syria to the Syrian regime in its chemical attacks, as well as raising the humanitarian aids to hundreds of thousands of displaced who Russian forces contributed to displacing and degrading them along with Syrian regime forces and Iranian militias. The report calls for the implementation of the ‘Responsibility to Protect (R2P)’ norm as all political initiatives have been to no avail. Therefore, steps should be taken under the Chapter VII of the Charter of the United Nations and the ‘Responsibility to Protect’ norm, which was established by the United Nations General Assembly, should be implemented. The Security Council is still hindering the protection of civilians in Syria. The report calls on the Security Council to refer the case in Syria to the International Criminal Court and hold all those who were involved accountable, including the Russian regime whose involvement in war crimes have been proven. Also, the Security Council should instill security and peace in Syria and implement the ‘Responsibility to Protect’ norm in order to preserve the Syrians’ lives, culture, and arts from being destroyed, looted, and ruined. Lastly, the report stresses that the Security Council should expand sanction to include the Syrian, Russian, and Iranian regimes who have been involved in crimes against humanity and war crimes against the Syrian people.